The decline in manufacturing employment in the United States has caused a wrenching economic adjustment, as one path to relatively well paying jobs has narrowed, particularly for workers without college educations. As the percentage of workers in our society who work in manufacturing industries decreases, and lower paying service employment has increased, wages have stagnated. The causes of the decline in manufacturing employment have been hotly debated. President Trump promoted the idea that product imports are a major cause of the shift away from manufacturing employment. There is certainly common-sense evidence to support this position. Clothing that was sold in the 1960’s with labels like Levi’s and L. L. Bean were largely made in America. Major television manufacturers, like RCA and Zenith also produced most of their products in this country. And, most people drove Chevrolets, Fords, and Plymouths that were made in America. This post examines industry based employment and shipment data along with trade data to evaluate the import and automation arguments. To understand the impact of imports on manufacturing employment, it is first necessary to know the value of goods shipped by manufacturers located in the united states, and the value of manufactured goods imported during the period examined. In this post, I examine data from 1963 to 2015. 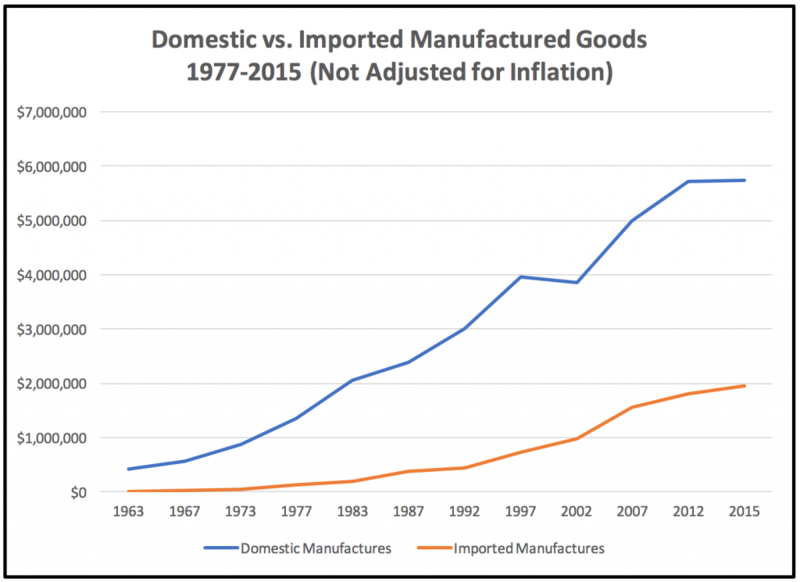 The data shows that manufacturing imports have significantly increased since 1963 to 2015, from 2.6% of the total of domestic plus imported manufacturing goods to 25.3%. But the extent of import penetration varies significantly among manufacturing industries – from a low of 6.9% of food products, to 63.9% of textiles and apparel. For apparel alone, 86.3% of goods shipped or imported were imported in 2015. In 1963, manufacturing employment was 17,035,000. By 1987, the number had increased to 20,935,000. But since then, manufacturing jobs have consistently declined, reaching 12,320,000 in 2015. 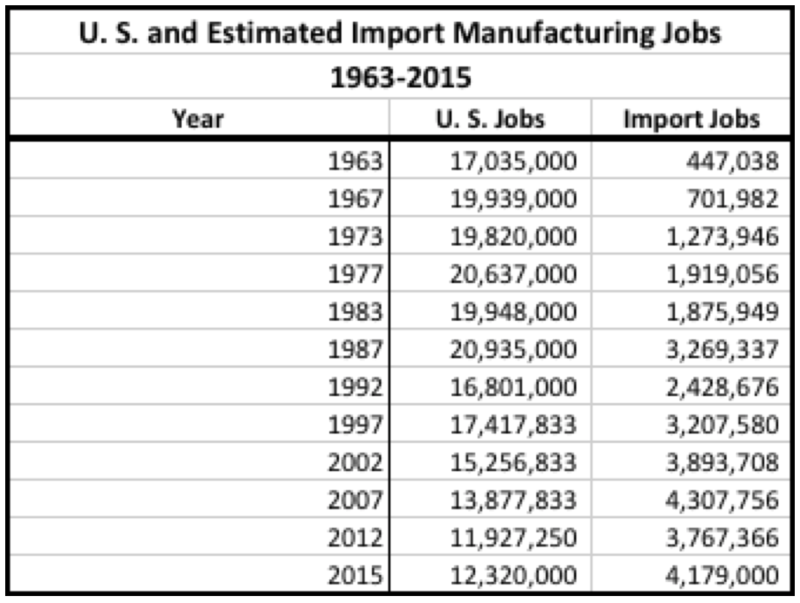 Total displacement of domestic manufacturing employment associated with import penetration grew gradually over the 50+ year period, reaching 4,179,000 by 2015 – one third of current manufacturing employment in the United States. The impact of import penetration varied significantly by industry. Materials related industries, like wood products, foods, chemicals and petroleum were relatively unaffected by import penetration, while durable product industries, like machinery, transportation equipment and electronics saw high employment impacts. Of the sectors examined, clothing and apparel lost the most domestic employment – nearly 1.8 million jobs. Electrical and electronic products, including computers and other high technology devices, had the greatest increase in foreign jobs for import production – almost one million jobs between 1963 and 2015. Several studies have shown that automation and process improvements have made manufacturing significantly more efficient than in the past. Thus, many manufactured products are significantly less expensive today than in the past, in real terms. 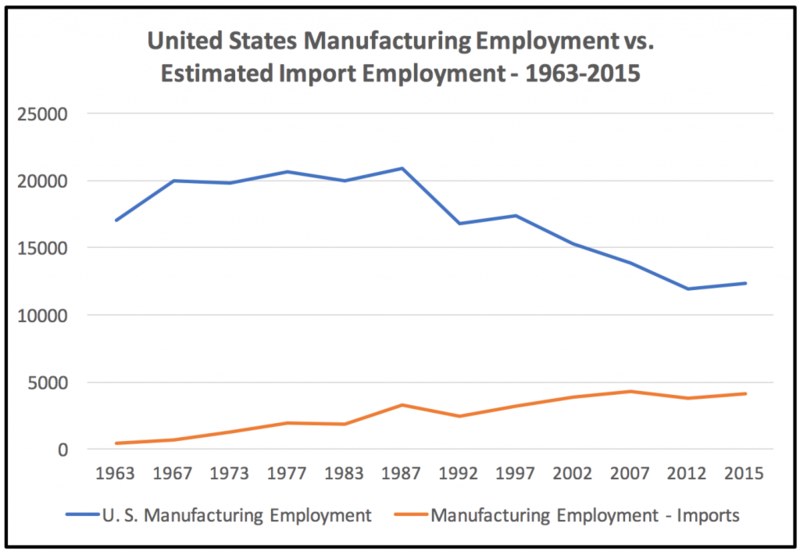 How large an impact has the substitution of imported manufactured goods had on manufacturing employment in the United States? The data shows that productivity increases have had a very large impact on manufacturing jobs. The value of domestically produced manufacturing shipments more than doubled between 1963 and 2015, in real dollars. Thus, without productivity gains we would expect employment to substantially increase. But, it hasn’t – in fact manufacturing employment is only 58% of what it was in the peak year – 1987. About 4,000,000 of the lost jobs can be accounted for by import substitution, but many more (28,000,000) were estimated to be lost as the result of increased productivity. Thus, imports have caused the loss of only 13% of total manufacturing employment losses, compared with 87% for productivity growth. The data shows that both import substitution and productivity gains have cost manufacturing jobs, but that increased productivity has been a far more significant cause of the decline in manufacturing employment. Without the effects of import substitution and productivity gains, an estimated 44,000,000 domestic employees would be required to produce the goods made and imported to the United States in 2015. Productivity gains are estimated to have led to the loss of 28,500,000 jobs based on productivity at 1963 levels, and import substitution is estimated to have cost 4,179,000 jobs. 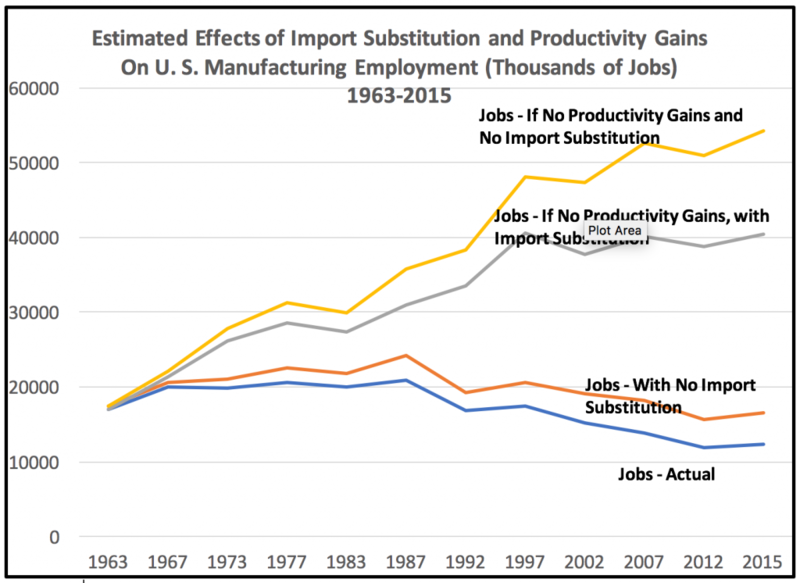 It is important to note that imports and productivity increases have substantially benefitted most U. S. residents, because they have resulted in significantly lower prices than would have been the case without the substitution of automation and more efficient processes for labor, and of lower cost foreign workers for better compensated American workers. Since 152,000,000 people are employed full and part-time in the United States, and only 12,000,000 are employed by manufacturers, most people are better off than they would have been without productivity gains and import penetration. Some approaches, such as the imposition of tariffs carry trade-offs that most likely exceed their potential benefits, both because they increase the prices of imported goods, and because they invite retaliation. Others, like the proposed Border Adjustable Tax on businesses bear closer examination, since they would have the effect of shifting the net burden of taxes from exporters to importers. Also worth considering are questions of currency manipulation, and whether American producers have fair access to markets in nations that export to the United States. Government policies to promote manufacturing should look beyond trade balances if they are to have significant impacts. Government has several tools available to encourage manufacturing, ranging from setting the regulatory environment, including labor, capital market and general business regulations, to enabling growth ‘with hard and soft infrastructure investments, educating and training a skilled workforce, supporting R&D and basic research and upgrading highways and ports.” It can also provide investment support and shape demand through public purchasing and regulation. Finally, given the reality that manufacturing employment is likely to continue to stagnate, most future employment growth will be in the service sector. For that reason, emphasis should be on mechanisms to improve incomes in low paid service sector jobs. Here, government can use its regulatory powers to provide low skilled workers who lack power in the job market with tools like minimum wage policy and rules that promote collective bargaining rights. It can also provide better access to relevant post-secondary education for young people, and for workers needing retraining, and by providing direct aid to displaced manufacturing workers. Employment data is from the Statistical Abstract of the United States, various years, and from the U. S. Department of Labor, Bureau of Labor Statistics – Current Employment Series – Table B-1a. Employees on nonfarm payrolls by industry sector and selected industry detail, seasonally adjusted – https://www.bls.gov/web/empsit/ceseeb1a.htm, various years. Note that without the lower prices that result from import substitution and productivity increases, prices would be significantly higher, and actual product demand significantly lower than estimated. Like other approaches, these policies carry trade-offs, since they can encourage employers to substitute automation for human labor.